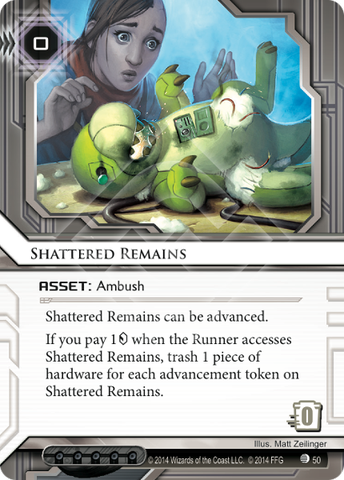 If you pay 1credit when the Runner accesses Shattered Remains, trash 1 piece of hardware for each advancement token on Shattered Remains. While initially this card seems underwhelming it has a variety of uses. First off, like all ambushes, it is improved by the existence of Mushin No Shin and Back Channels. Mushin reduces the clicks/credits necessary to set the arrangement up. Back Channels retroactively makes all of your "click to advance" clicks into "click for 2 credits" by giving you 3 credits per advancement counter. Next up it fires for just 1, like junebug. This isn't a matter of needing 4 like snare or 3 like overwriter. Firing off a shattered remains is a casual decision, you'll be back at capacity after clicking for credits once. The actual effect of this card is where it seems like a letdown at first. Blowing up their hardware doesn't turn off their icebreakers or flatline them. The key thing to remember is that the runner put those hardware cards into their deck for a reason, and that they probably don't have a plan for them getting destroyed. Killing a Clone Chip keeps dead whatever it would have cloned. Killing a console can deny them turns worth of tempo, whether from lost credits from desperado or lost virus counters that would have come from Grimoire. Popping their chips may make their underworld contacts stop sending money. There isn't a paid ability window between access and the ability firing, so they can't get their stuff off of personal workshop if you are living the dream. R&D and HQ interfaces exploding is a big deal. Plascrete suddenly being gone can be the game. Traps have seasons though. This isn't a start of game trap. Its dead in your opening hand, who wants to blow up the hardware of someone who hasn't installed any yet? Its an autumn trap, after the game has assumed its shape. Put it down and advance it twice behind ice you suspect the runner can get through. Like aggsec it is effective with just a counter or two on it, so if the runner suspects a trap and draws out of junebug range before accesses it won't save them. Ultimately, I think this card won't be fundamental to a corps strategy, but with a cheap 1 to fire, no influence and an effect that only really needs 1 or 2 counters to get off its an easy splash. Welcome to the new autoinclude now that SIFR will be in the new Meta and all over the place. You better find a spot for this 3 times in your deck in 2017 forward until we have another hard counter. And you better advance it at least 2 times so you can deal with one sacrifical construct that protects SIFR.